Services « Village Signs Inc.
Can be an alternative way to letter your commercial vehicle. Because they are removable, magnetics can be used on more than one vehicle. Custom vinyl banners are an effective way to get your message displayed. Dates and times can be changed for multiple later uses. All banners are weather resistant and can provide a cost effective way to advertise your business or event. Village Signs, Inc. provides high quality boat graphics and lettering throughout Southeastern Massachusetts including Cape Cod. We guide you through the entire boat lettering process, assisting you with making informed decisions about design, color and style. Our design team will work with you, revising your boat graphics until you are completely satisfied. An affordable and effective way to advertise your business, event or political campaign. The standard size of 18” x 24” is the most popular, although we do offer smaller and larger sizes. We also offer rod iron holders for a more secure and classic look. If you are a start-up business looking for the right image, or an established business updating your current logo, we provide custom corporate logo design. If you have a van, pick-up, step-van or box truck, one truck or a fleet of thirty, we are the company for you. Village Signs provides comprehensive quality truck lettering from design through completion, from start to finish, we can handle all your truck lettering needs. Village Signs can provide an exterior post and panel sign made of wood, metal or PVC materials. These signs can be illuminated or non-illuminated, and are a cost effective way to showcase your business. Interior signage helps control the flow of traffic within your building. 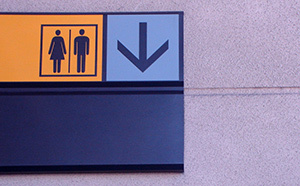 This can include restroom signage, room numbers, staircases, exits and entrances. All interior signage is ADA Compliant.